I recently arrived in London where I will be pursuing my graduate studies. As I was walking on the campus of University College London (UCL) for the first time a few days ago, some of the first objects struck me the most were trashcans. These black, rectangular-shape trashcans with a pyramid on the top have three words that pop out – UCL, recycle, and landfill. Seeing the word ‘landfill’ startled me. It made me think twice about the materials that I am consuming that could be tossed in the ‘landfill.’ When I have no choice but to choose to toss items in the ‘landfill,’ the feeling of guilt stirs in my stomach. 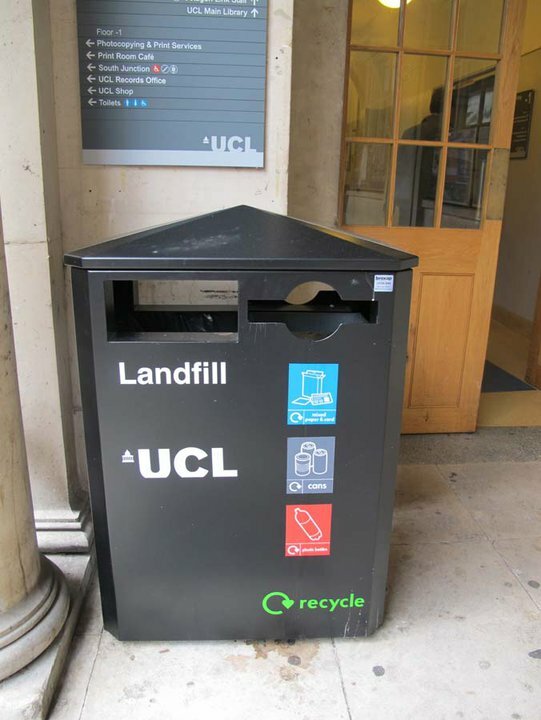 It’s a brilliant idea for UCL to post ‘landfill’ on trashcans so that we would think not only about where our trash is going, but also choosing carefully what materials to purchase and use so that we can consume as little non-recyclable materials as possible! I wish every public trashcan in America had those choices! It’s a GREAT thing. Thanks for blogging about it! At home we have a similar system, but there we don’t use the word landfill, rather “compostable”. So anything that can turn into earth again can be put in that bin, like food leftovers. Wouldn’t ‘compostable’ be better than ‘landfill’ because anything that goes in the landfill is considered something that would remain ‘unaltered’ in the grounds whereas anything that is composted would turn to soil again? Thus, I would actually feel better tossing trash in the ‘compostable.’ However, what do we do with the materials that cannot be composted or recycled such as styrofoam, plastic toys, and milk cartons?